Today: With a little thrift, you can turn your office leftovers into a classy desktop picnic -- bubbly not included. Sometimes, eating lunch at your desk can be a real bummer. Sunny days tempt you from just outside the window; so close and yet so very, very far. You have the sudden urge to leave your TPS reports behind and run through the hills, roll in the grass, and feast on a picnic of crusty bread, good cheese, and wine. We can't help you with the running through the hills part, but we can definitely satisfy your picnic urge. With a little thrift and some calculated indulgence, you can make an office picnic worthy of a tablecloth -- or at least a cloth napkin. Scrounge around in your fridge for some cured meats, cheese, and a few hunks of bread. Or, if you want to be extra thrifty, wait until you have an office party and then re-vamp the meat-and-cheese plate leftovers. Pick up a tart green apple and a bottle of bubbly (water, that is) from the corner store to round it all out. Voilà! You've got a spread fit for a picnic. How do you add a touch of class to workday lunches? Let us know in the comments! I kept a beautiful placemat and napkin combo with a real plate, flatware, and water goblet in my file drawer with a small sponge, dishcloth and mini dish soap. My meals seemed to live up to these accoutrements as time went on. The inspiration for linens came from my daughters parochial school where all kids brought in their own to cut down on paper waste and make for a nicer dining experience. And this was in 2000! 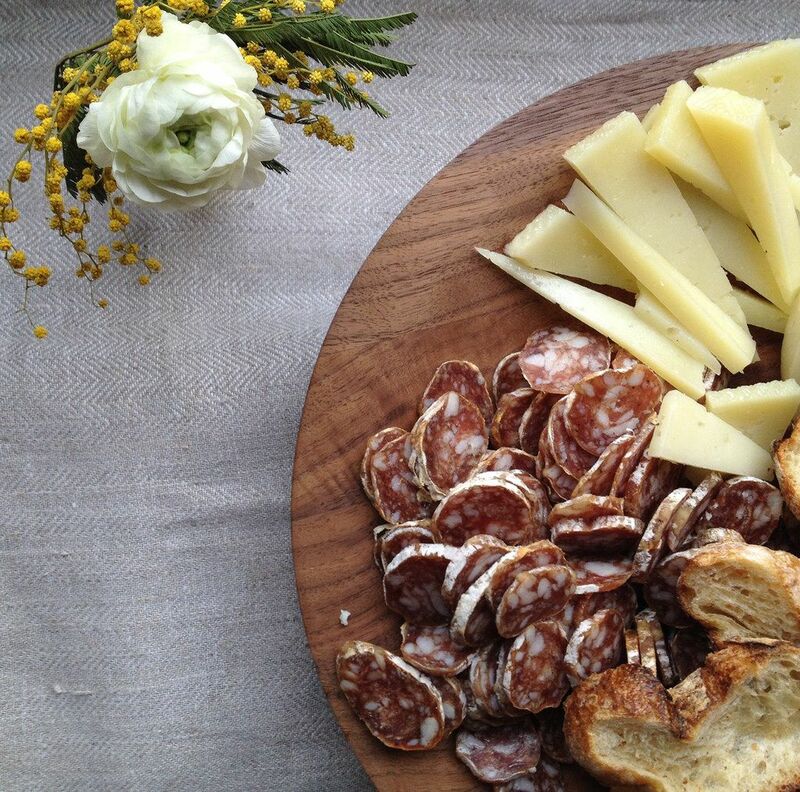 This is one of my ideal lunches -- cheese, fruit, and bread +/- cured meat!